If you're here for the Cascade Blog Hop Tour, Welcome! If you're familiar with my work, you'd know that blue is my favorite color. I love every shade - from navy to aqua! 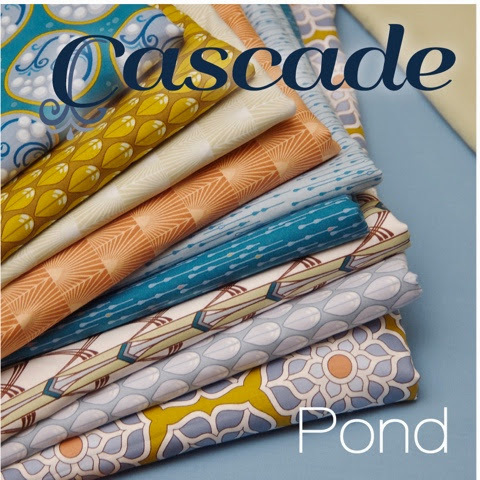 So when Jessica Levitt asked me to make some samples for Fall Market with her new line Cascade, I was super excited! Plus, I was already a fan of her work - Timber & Kingdom are great lines too. So check it out.... There are 2 color ways. Of course, I love the blues, but I'm also loving the other colors she added. I think I might need some serious yardage of Splash in Fog ( the 3rd one from the top!) I can see myself using it in a ton of upcoming projects. Are you ready to see what I made?!?! This is my Travel Purse. It's a pattern that I have been working off and on for the past year. My inspiration for this purse was my mother's Louis Vuitton purse. She's had this purse as long as I can remember. Ever since I was little. I wanted to make it the same shape but also make it fully functional by adding pockets on the sides. I also made the straps long enough so that it can be placed on your shoulder. 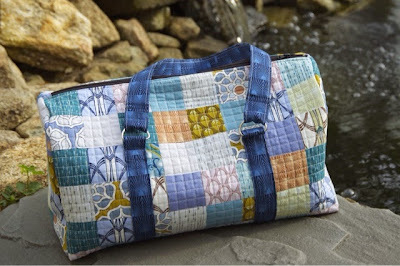 The entire bag is all patchwork - 2" squares, quilted and fully lined. This one I made for Jessica is definitely the best one yet! I'm happy to say that the pattern will available for sale early next year. Here's a tutorial on how you can make one. Last but not least, here's a pillow I made. The pattern is one that I created called "Waves". I couldn't resist making "Waves" with Cascade. I had to play on the whole water theme.... It's made mostly of strips and is a great scrapbusting pattern. I made this pillow last because I knew there would be many usable pieces from the other projects. It was quilted with what I call 'lazy diamonds' = Staight lines + Diagonal lines = diamonds on a slant. It looks like they're lying down, hence the name 'lazy diamonds'. 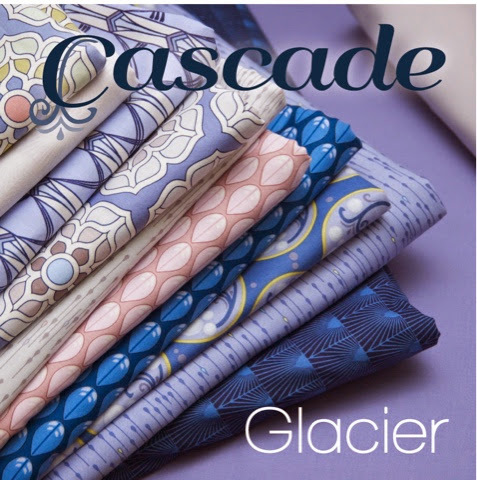 This pattern will be available for sale as a quilt pattern in Spring 2015. There are more Cascade projects in her look book! And they're all amazing! Wait...... There's more! Windham is giving away a FQ Bundle to one of my lucky followers! 2) Leave a comment here - Answer this question - if you had an unlimited amount of time (hahaha) - what project / quilt would you want to make? That's it. Easy Peasy! I'll choose a winner on Wednesday, October 22nd. Good luck, peeps! Thanks so much for stopping by. Thank you so much for letting me play with your fabric, Jessica. I know your booth with all its pretties will be a big success at Fall Market! PS. All photos courtesy of Jessica Levitt. An unlimited amount of time? As long as I also had an unlimited amount of energy, I would make a cathedral windows quilt for our king-sized bed. By hand. I follow you on Instagram, where I am wordygirl11. If I had an unlimited amount of time today (like before my guild meeting tonight), I would finish all of block of the month stars. Then I would bind my show and share quilt. After that I would make my bingo cards so I can join in the games tonight. With my remaining unlimited time (ha), I would work on some WIPs and brainstorm a quilt for my baby girl (coming in December) . An unlimited amount of time - wouldn't that be wonderful!! I'd hand quilt my current plus quilt but I need it finished by next week! Oh, there is never enough time is there? I would love to make a grandmothers garden. I am following with GFC, I don't have instagram. I have unlimited time and still cant finish, I would make a KING size OCR ruler Quilt, I have the fabric collected.. Following on Bloglovin'. All the quilts on my dream list. I love your travel bag !!! Following you! 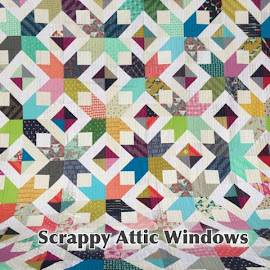 I would love to make a house block quilt with all the blocks being different sizes and shapes. 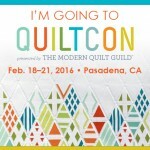 I saw a beautiful one at the last quilt show in Long Beach.....maybe you saw it too!!! Of course I follow you on IG & your blog. 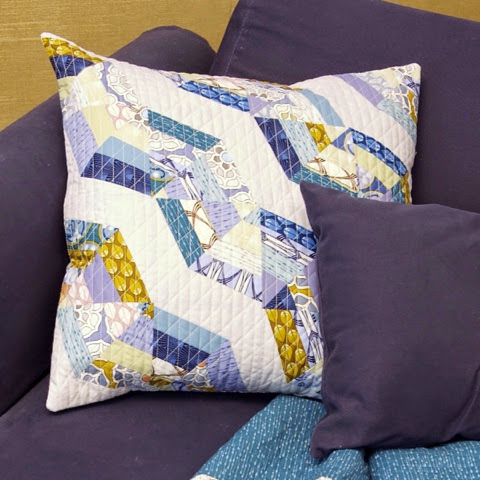 Unlimited time sounds perfect - I would make an EPP hand quilted beauty for our king size bed! Wow, unlimited time....hmm. I would love to create beautiful dresses for little girls in need....hundreds of them! Love the little selvage bag. Following GFC & Instagram. 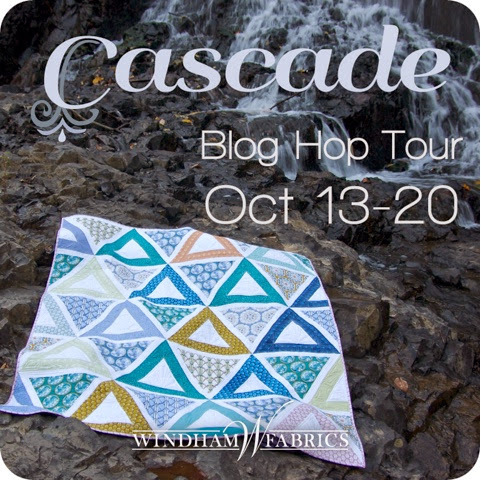 Just discovered you on this blog hop. Following you on IG and bloglovin'. 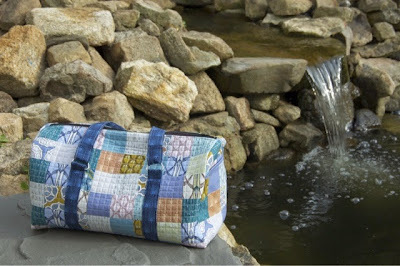 I love the Waves pillow with Cascade. Nice! HELLO, I'd make a quilt for my bed (I'm a beginner)! Love your projects! Follow you on Pinterest! I follow your blog.. but I do not have instagram. I would love to make a mariners star quilt! Like you I am a blue girl! I follow your blog, but don't have Instagram. wow, unlimited time, I can hardly imagine. But given it, I would finally start piecing a 7 shades of blue wave design I have had sketched and planned for a few months now. I would like to make a quilt with this great fabric. I'm a new follower of your blog and on Instagram as Ceciliaquilts. I'd use this fabric to make another Park Bench quilt. Hi! I love the pillow you made and I just started following your blog. I don't have a smartphone so no IG. If i had unlimited time I'd probably make an heirloom, king-sized, hand pieced, hand quilted, double wedding ring quilt.Cheers. Love the bags! I'm a former SoCal girl...grew up in San Pedro. If I had more time I'd "MAKE ALL THE QUILTS!" I seriously have such a long list of quilts I WANT to make, I'll never get around to them all. I'm a new follower on Bloglovin, nice to meet you! Jenn, I'm now following by email. I'm so inspired by your posts already. Loving the selvage purse. You're right who could steal that w/Jessica's name all over it ha ha. Jenn with unlimited time I would finally make a queen or king size quilt for MY bed. Or convert it to hang on a large wall that is totally baren. 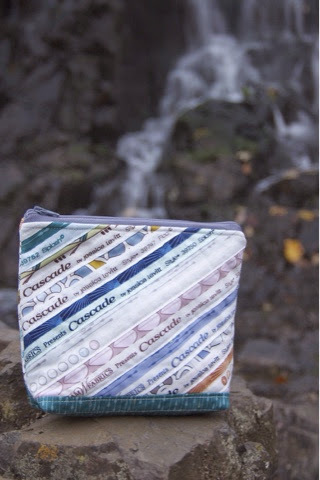 I love making bags and pouches too so that's one way to be kind to others is make 'em a little something to carry their stuff . Paying forward just feels so good, everyday. 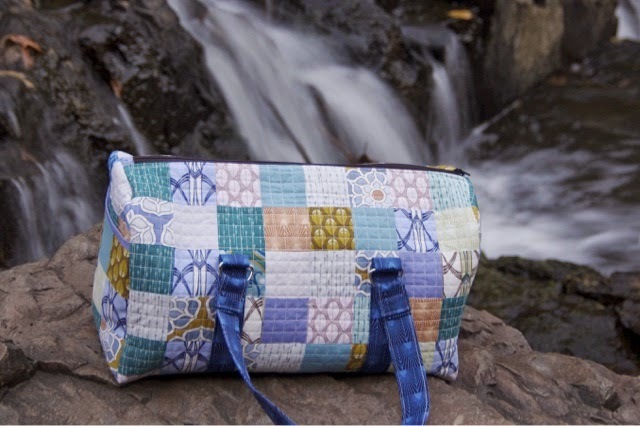 If I had unlimited time, I would be quilting everyday! I am new to this and I love it . I have not ventured into making anything other than quilts so far, your travel bag is really nice ! I follow you on everywhere now and also by email ! thanks ! I am a follower! Hmm, I've been intrigued by those Millifiori quilts. I wonder how long it really takes to make one of those. I would make a huge King bed coverlet. I keep putting off working on something so big because the quilting part scares me. I would make a king sized quilt if I have an unlimited amount of time! Great job on these projects, I saw them in person at quilt market. I especially am after the pattern for your Louis Vutton impersonation tote! I can't find it anywhere. Is it coming out soon?